Whoops! Maybe you were looking for Procrastination? The terror created by a glance of a scene like this is insurmountable. We've all been there : The dishes are slowly piling up on the sink, The cutlery draw is empty, this morning you ate breakfast from a saucepan, the smell that emanates from the kitchen is comparable to the odour of durian mixed with sweaty socks, your friends have stopped dropping by, and the cockroaches have placed a flag on the peak of the filth and declared it their nation. Never fear! Uncyclopedia's HowTo section is here to help! Well at the very least, it is going to present you with a method so you can help yourself, because you're certainly not passing that job on to me! 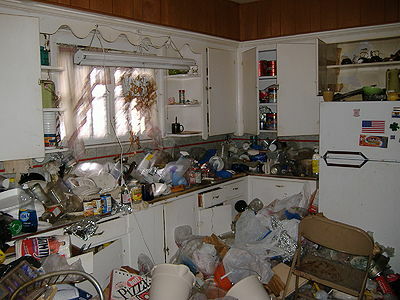 Dirty Dishes can be found in a variety of locations. The Kitchen Bench - If you haven't been able to see your kitchen bench for a while, chances are the stuff that is on top of it needs to be washed up (or thrown out). The Cooktop - Remember that Spaghetti Bolognese you cooked last Friday and only ate half of it? Well, the rest is still there. Computer Desk - Yes, there are dishes there, but you may have to look under the chip packets and beer cans. You disgusting slob. Coffee Table - Tired of watching TV looking over the top of plates filled with half eaten Indian food? This will be your lucky day/week/fortnight/month. Next to, Underneath or in, your bed - Do you make a habit of this? Unless it was the breakfast-in-bed you cooked in the morning for your one night stand the other night, you, sir/madam.... are gross. Dishes can also be separated into distinct "qualities" of cleanliness. Practically Clean - Why did you use 10 glasses today? And was it necessary to use that plate to simply place the plastic container of salsa dip upon it? These are not the questions we are here to find out, however it means that many of your dishes are almost clean already! Yay! A Few crumbs - To be honest, if you wiped the crumbs off and put the dish back in the draw, would anyone really notice? Well, yes, you would. And I don't feel like having you blame me for food poisoning anyway, so let's move on. Icky Goop - Icky Goop is unpleasant, you feel a little bad about washing it down the sink, but it certainly can't go in the bin, unless you want a whole other drama when it comes to emptying the bin later that day/week/fortnight/month. Collect all the dishes from the various locations and collate them in the kitchen. This may require some tricky balancing of items and Jenga-like maneuvers of items already there. If you have a small kitchen, or have a ridiculous plethora of dirty dishes, which is making stacking impossible, don't forget that the floor and the dining table are both valid surface areas to store them. Also, avoid the compulsion of stacking them in "out of sight" places like kitchen cupboards and the oven. If you are feeling ambitious, attempt to sort the varieties of “dirtyness” into groups. This will not only make your life easier in the future, but has the added benefit of potentially making your family and friends question whether your obsessive-compulsive disorder has gotten a little out of control and you need committing, which would thereby allow you to avoid the entire problem completely. To prevent electrocution, avoid soaking electrical appliances such as toasters and electric kettles. Allows the crusty and hard stuck stuff to become, well, less crusty and less stuck. Allows some extra "conscience free" time wastage before step four commences. Note that some choose to skip this step (often resulting in domestic violence), while others choose to ONLY do this step (leading to a high turnover of new flatmates). Both are not recommended. There are many ways to achieve this step. However, writing an uncyclopedia article is by far the most effective. However, if you do not have the time or creativity required, consider Lolcats. After a certain period of time, procrastination simply won't cut it any more. You have one of three options. Either hide the dishes, hide from the dishes, or pretend the dishes don't exist. If you have a spare bedroom, consider moving the dishes into there. If you have a psychological issue, pretend that the dishes don't exist, and tell yourself that pixies stole them. If you are a bit of a handyman, build a wall around the kitchen, and live on takeaway instead. If you are a druggo, just use the dishes as they are, and no one will know or care. If your mother lives nearby, move in with her for a while, and hopefully someone will clean the dishes while you are away. Feel free to be creative with this step! If you have children, passing the task to them is both an effective disciplinary tactic and also an elegant solution to the problem at hand. Switch off the lights in the kitchen. For daytime solutions a large bedsheet could be used as a throwrug. Call a successful friend and create an elaborate sob-story. Tell him/her that you have just overcome a drug abuse problem, or that your wife ran off with your best friend, or whatever, but make it GOOD. Then ask something of him that may help clean your dishes. If they are a scientist, ask them to build a cleaning robot, if they are an insurance salesman, ask them for the best method to run a truck into your house and then have everything claimed on insurance, and if they run a cleaning business, uhmmm... well, you'll think of something. If the house is not yours (ie. renting or squatting), consider burning it. ↑ And they are also wondering what you are doing in their kitchen.